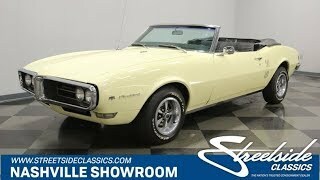 Hi, I am interested in your 1968 Pontiac Firebird (stock #1122-NSH) listed on Autotrader for $24,995. I'd like to get more information about this vehicle and confirm its availability. Would you like to own one of the original Pony cars, but one that is a little unique? Then check out this Firebird convertible. Offered just in time for fall foliage cruising with a power operated top and looking good in its factory correct color of Mayfair Maize, its ready to roll. You just dont see too many of these Firebird convertibles out there and when you do, you notice them. The front end leads with a sharp looking chrome bumper that splits the air side to side and into the grill which is flanked by quad headlights. The center section fairs nicely into a crisp ridge that runs back along the centerline of the hood. That crease is echoed on the tops of the front fenders and also along the side of the car with a line that runs front to rear. Firebird appears in script on the front fender, along with the Firebird itself and there is a Pontiac arrow on the rear fender. The view from the rear is of those unique double slot taillights with a Firebird on the gas cap between them and Firebird in script on the trunk all underlined by a sharp looking back bumper. Open the door and you will find a very sharp looking Black interior which is the color this car was delivered with new. The door panels are simple with horizontal lines and a Firebird badge along the top and slashes of chrome both top and bottom. The seats have pleated center sections with smooth vinyl along the sides. There is a three spoke steering wheel with the Pontiac Firebird in the center and a neat and clean dash behind it. It is stock and simple with just the speedometer and a fuel gauge mounted in front of the driver. In the center is a wood tone panel with the original AM radio mounted in it, the ventilation controls below it, and the shifter for the 3-speed manual trans mounted in the floor. Hit the power roof button to drop the top for some open-air motoring, and if you want to, you can give it that clean look by covering it with the black roof boot. Pop the hood and you will find a 350 cubic inch V8 engine which is painted Pontiac Blue and has been in this car for a while. It has a survivor look and feel to it and there are signs of good regular maintenance with a newer battery as well as the plugs, cap and wires, and belts and hoses. A chrome Edelbrock air topper feeds an Edelbrock carburetor and intake manifold. Finned Holley valve covers are black with the tops of the fins brushed to aluminum. Long tube headers get the spent gases out and send them downstream to Flowmaster mufflers. A newer radiator keeps things running cool and Power flows back through that 3-speed manual transmission to a solid axle and 10 bolt rear-end mounted on leaf springs. A coil spring front suspension gets the job done up front and the rubber meets the road through 205/75R14 tires mounted on 5-lug alloy wheels with PMD center caps and polished trim rings. Come on down and check this sweet ride out. Then take it home and head out for some fall fun.